Hair loss and difficulty with hair growth are problems that many people face. The people dealing with such problems range in ages from as young as teenagers to the elderly. It also affects both men and women, with men experiencing hair loss more often. When faced with hair loss, you have the choice of either letting it run its course without any treatment or hiding it or to try and hide it with hairstyles, hats, scarves, etc. Understandably, many who suffer from hair loss try everything they can to stop and prevent further hair loss and promote new hair growth. A natural treatment for hair loss has been growing in popularity since 2015: rosemary essential oil. There are many historical claims about rosemary oil for hair and there are even recent scientific studies to support these claims. Is this true? Before we dive in on how it might help, let’s take a look at what causes hair loss and slowed hair growth. It may be hereditary – Male pattern baldness and androgenetic alopecia are both hereditary conditions. Hormonal changes and imbalances – Hormonal imbalances are the roots of many health problems we experience. Taking birth control, stopping birth control, becoming pregnant, steroid use and poor nutrition can cause hormones to change and become imbalanced. 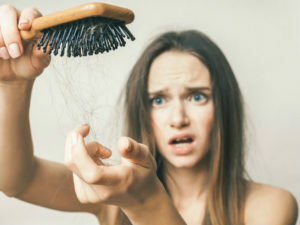 Medications – If you happen to take antidepressants, anti-inflammatory drugs, blood-pressure medications, or any other prescribed medications, they may be part of what’s causing your hair loss. Drug use – It goes without saying that the use of drugs is overall bad for your health and can promote hair loss. Stress – Stress can be caused physically or emotionally. Experiencing a car accident, undergoing surgery, and even getting the flu can cause enough physical stress to cause hair loss. Emotional stress can be caused by events such as the death of a loved one or going through a divorce. Excessive styling and product use on hair – Styling your hair in tight braids, applying waves, dying your hair, straightening and curling hair with a hot iron, and other vigorous treatment to your hair can cause damage to your roots. Nutritional Deficiency – Being deficient in iron, protein, vitamin B, and other nutrients can cause hair loss. While these aren’t all of the causes of hair loss and hair thinning, they are some of the most common. Pay attention to your day to day habits, the way you feel, and talk with your doctor to help determine what your cause of hair loss may be. Even though the rosemary essential oil remedy may work for you regardless of your lifestyle, it’s always best to address the root cause of your hair loss if possible. Not only will your hair grow back healthier and stronger, but your health will most likely improve as well. It’s also possible that you won’t be able to figure out why you’re experiencing hair loss. If this is the case, you probably don’t need to worry. This is because rosemary essential oil is so effective at promoting hair growth that there is a big chance it will still work for you. Being vulnerable to the stress of hair loss, you may find yourself considering hair growth products that are expensive and full of chemicals. 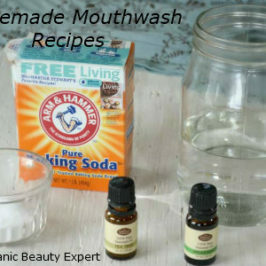 Maybe you’ve already tried many of these products, only to find that they do not work out in the long run or that they’re just too expensive to maintain. Unfortunately, some products may even do more harm than help. Not only is this a waste of your time and money, it causes stress both physically and emotionally. Regardless of who you are, how old you are, or what gender you may be, the rosemary essential oil remedy is a solution that many swear by. But is there any truth to this claim? Let’s get into the nitty-gritty on what rosemary oil is and why it can potentially help treat hair loss and promote hair growth. As you can tell from the name, rosemary oil originates from the rosemary plant, scientifically known as Rosmarinus officinalis. It’s a perennial herb that features needle leaves with flowers colored pink, white, blue or purple and is native to the Mediterranean countries. Antioxidants – We just went over how rosemary essential oil contains antioxidants. 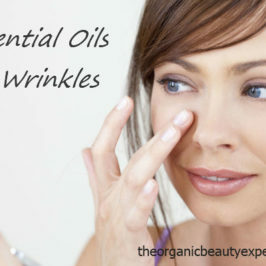 The antioxidants found in rosemary oil can help to prevent and fight damage from free radicals. 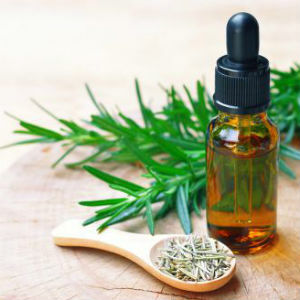 Antibacterial properties – Like many other essential oils, rosemary oil has antibacterial, anti-fungal, and antiseptic properties capable of preventing the development of scalp infections as well as dandruff and a flaky scalp. Anti-inflammatory – One of the most important benefits from rosemary oil is its ability to reduce inflammation of the scalp and hair follicle roots. Reduction of scalp inflammation has the potential to reduce hair loss and speed up hair growth. Stimulant – Because rosemary oil can help increase blood circulation where it’s topically applied, it is a powerful stimulant. More blood flow to the hair follicles means more nutrients from blood, resulting in hair that grows faster and healthier. Reduces Oiliness – Hair loss can be caused by an oily scalp. That’s because dirt, grease, and dust can clog the follicles and prevent hair growth. Rosemary essential oil can help to regulate your scalp’s oil levels, keeping it clean and healthy to promote hair growth. With the listed benefits, it’s no wonder people rave about rosemary oil hair benefits to help treat hair loss by slowing it, stopping it, and in some cases even reversing it. What better way to determine rosemary oil hair benefits than to dive into a scientific study. A popular study was done to compare the effectiveness of rosemary oil compared to a popular hair loss treatment drug, minoxidil (at 2% strength), also known as Rogaine [Source]. Rogaine is meant to work similarly to rosemary by helping to improve circulation to the scalp and hair follicles. The study took 50 patients and assigned them to two different groups. While group number 1 applied rosemary essential oil to their scalp, group number 2 used Rogaine. The study took the course over a span of 6 months. Progress was taken halfway through the treatments, with both groups showing no noticeable improvement. However, after the 6 months, there were increased hair counts for both groups. Surprisingly, the effectiveness of rosemary oil compared to Rogaine is similar, with rosemary oil causing less itching for patients. When considering how much rosemary oil costs compared to Rogaine (and not to mention how it causes less discomfort), it’s a much more financially feasible treatment option for people to choose. Before deciding to use rosemary essential oil, or any other essential oil at that, it’s important to consult with your healthcare professional. Essential oils may also be harmful to women who are pregnant as well as babies and young children. If you’re convinced that rosemary oil for hair loss treatment will be beneficial for you, then you’ll need to learn how to use rosemary oil the right way. Always make sure that the rosemary oil you purchase is 100% pure, without any dilutions or synthetics. With all of these treatment methods, it’s important to keep in mind to use smaller doses at first. This is because essential oils are very strong. Even an amount as little as 1 drop can have an effect. Without further ado, let’s get into how to use rosemary for hair. Create the concoction by heating the coconut and castor oils in a small pan. Place it over a low flame for no more than 1 to 2 minutes, making sure the oils don’t reach smoking point. Gentle heat is more than hot enough for this treatment. After heating the coconut and castor oils, add the 4 drops of rosemary essential oil and stir. Use your fingertips to gently and thoroughly massage the oil into your scalp. If there is localized hair loss in a specific spot, then make sure to focus on massaging this area a bit more. 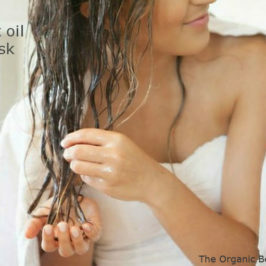 Allow the oil to soak into your scalp for up to 15 minutes before washing it out. Try not to go longer than this to prevent irritation and drying of the scalp. Use this hot oil treatment once or twice a week going no less than 3 days between each time. Create the serum by simply mixing together the ingredients and storing it in the amber glass dropper bottle. The application should focus mainly on your scalp. After application, brush your hair to help evenly distribute the serum. Make the hair mask by whisking the ingredients together in a mixing bowl until the consistency is smooth. Apply it to your scalp and hair and let it sit for a minimum of 30 minutes and as long as 60 minutes. Use lukewarm water to wash the mask off and allow your hair to air-dry. With your massage partner, take turns using the fingertips to thoroughly massage the oil into the scalp. Start the scalp massage at the front of the hairline, slowly making your way down to the sides, and eventually to the back. Circular motions with firm pressure are the best way to help promote blood circulation. Mix the oils and honey thoroughly before applying to your scalp as well as the rest of your hair. Tie the hair up after application and cover with a scarf, shower cap, old shirt, etc. to prevent the treatment from getting on your pillow and sheets. Leaving this in overnight helps to hydrate, nourish, and promote hair growth. Now you know that rosemary essential oil has legitimate potential to treat hair loss and promote hair growth naturally. Like we said, consult with your health practitioner before continuing to use rosemary essential oil. Rosemary oil is only meant to use for topical application and should never be ingested orally. 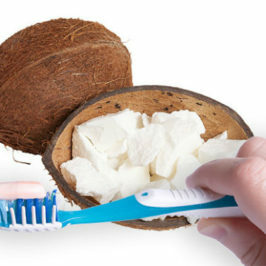 Start with small doses and never use the oil without diluting with a carrier oil such as coconut oil. Enjoy using rosemary essential oil for natural hair growth for at least 6 months before determining whether or not it works for you. You may be pleasantly surprised.